We recovered one of our Verticlair Polyunnels from Filclair, I think this photo is lovely. 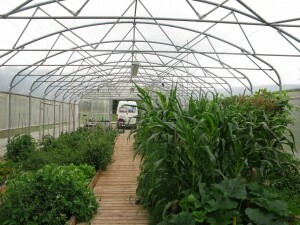 As well as manufacturing Polytunnels we are agents for Filclair from France who we source Multispan structures from. The Verticlair has straight sides and this particular structure has a fully automatic roll up side ventilation system. A great Polytunnel cannot make a good gardener out of you put it is a tool that a good gardener can do great growing with. 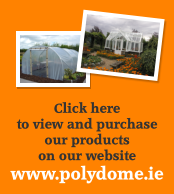 We now have 15 Glasshouses and 4 Polytunnels on display at Polydome’s HQ at Crinkill House in Birr. With Birr Castle Demesne close by any green fingered people looking for a Greenhouse (Glasshouse or Polytunnel) will find the trip well worthwhile. As well as seeing the largest display of Greenhouses and being able to talk to product specialists to sort you out with the best Greenhouse or Greenhouses Accessories for your situation, with good places to eat locally and the renowned Gardens and Science Centre at Birr Castle it will be a great horticultural day out. Its that time of year again, if your anything like me, then its safe to say that you have at least, another 4 days before you even consider starting the christmas shop. However if you are planning ahead, why not cosider one of our Christmas gift cards as an option. It can used on Accessories, Polytunnels, Glasshouses or any stock item. Gift cards are valued for 12 months. So why not put the spring in someone step this christmas and give them a Polydome Greenhouse Giftcard.